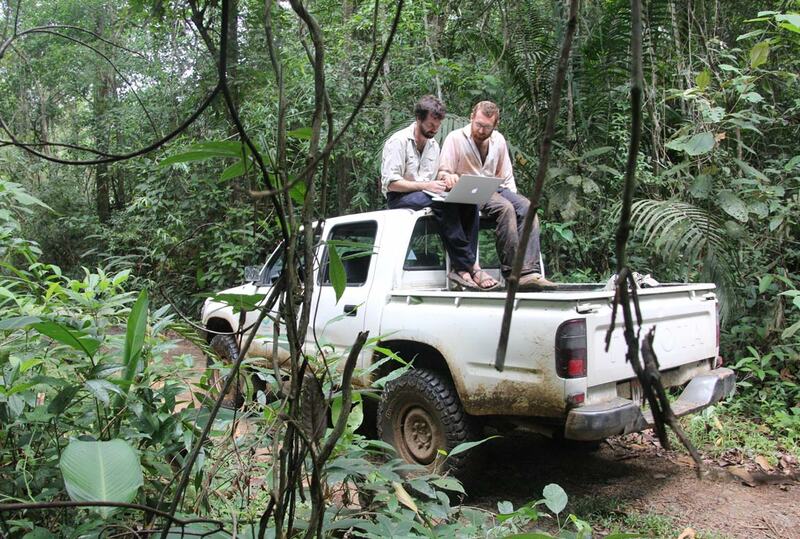 There are specific tools used in back country living and digital making. When we combined these tool boxes into heavy backpacks to bring on our expedition, we brought the infrastructure to support the most critical tool, our minds. 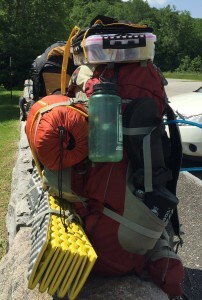 One team member’s pack on day 1, complete with camp stove, sleeping mat, tarp, and box o’ microcontrollers and misc. electronics. My daily life as a hiking hacker began with coffee at the creek side. A warm drink with at least a little bit of caffeine is critical to both my making methodology and my backcountry lifestyle. With the constant rushing of Citico Creek and the caffeine through our veins, we would open each morning writing in our field journals, often responding to a prompt or design challenge. We would finish each night with a reflection on the day’s work and experiences and document each activity as it happened. Our journals became a way for us to communicate with ourselves and the other hiking hackers. 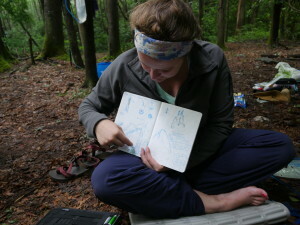 Sharing sketches from my journal after drawing the life I saw around me near camp. One of the most valuable parts of this expedition was the opportunity to live in the milieu we were drawing inspiration from. On the first morning in base camp, we searched for scents. Not only did we wander the woods sticking our noses unusually close to any and all forest inhabitants, we needed to find a scent we could collect and return to the camp to share. 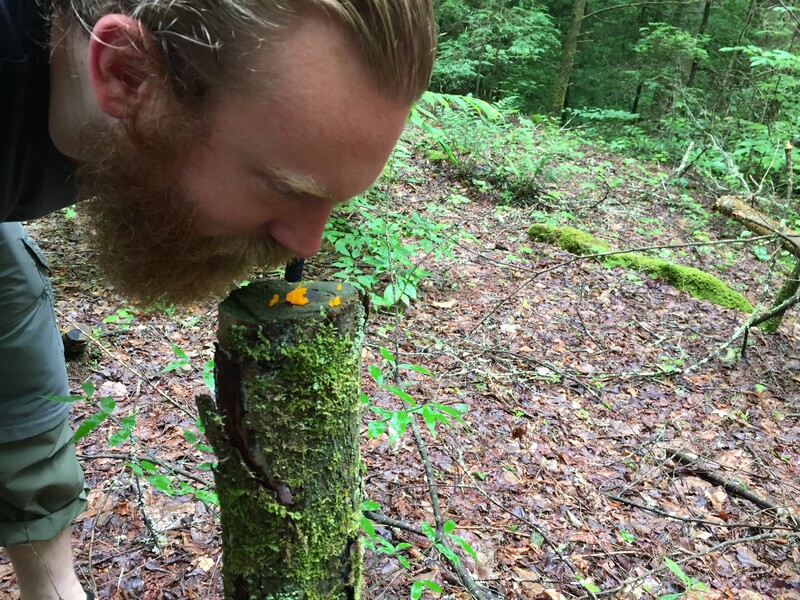 Paul takes some time to smell the slime mold. Forced to engage with my surroundings in a novel way, I found myself asking fundamental questions about my perception. The first descriptor I thought of for the scent of a mushroom was ‘woodsy’ but what does that mean when everything is in a forest and inherently ‘woodsy’? Descriptors like meaty, rotten, warm, rich crawled through my mind, but all of these descriptors crossed senses. What does this indicate about the way I understand the woods? Am I constantly creating a coherent representation of my surroundings with little differentiation between modes of perception? Should I be striving to separate my experience of the senses? When I ideate and build a digital device for interacting with nature, should I attempt to create a unified representation of nature or break it down into different aspects of our surroundings? What are the consequences of each of these design choices? Is translating one sense to another enhancing or detracting from our experience of the nature? Or are we simply changing the experience and broadening our understanding of the world around us, without positive or negative connotations of that change? My conclusion from this smelly meditation was that there is no wrong way to explore nature, given that my exploration does not harm or change the world around me. The point of sniffing things wasn’t only to experience the woods in new ways, but to reflect on the experience, our perceptions and senses, what we want to build, how we want to build it, and why we want to build it. Reflection like this is the key to hiking hacks and any joint making/exploring project.